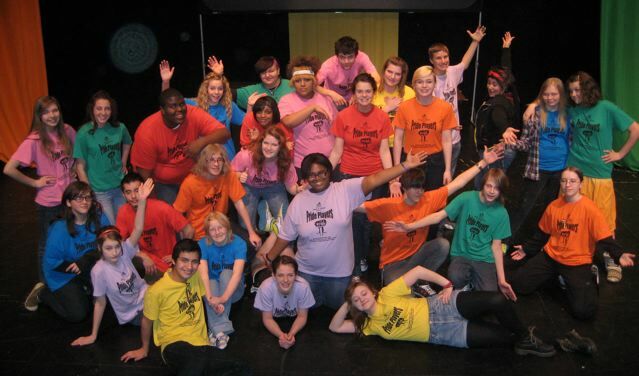 I was lucky enough to be one of nine program directors that got to attend the first ever Queer Youth Theater (QYT) conference hosted by the MUKTI Fund in Orlando in 2010. After the positive experience of last year, I was really looking forward to this year’s conference because of the unique opportunity it offers QYT directors to connect, share ideas, inspire and recharge. The 2011 conference was held this past July, hosted by the Omaha Theater Company at the historic Rose Theater, and I was not disappointed. I’ve been the Director of the YouthAware Educational Theatre program with the New Conservatory Theatre Center in San Francisco since 2001. http://www.nctcsf.org/YouthAware.html We have been working to educate young people about homophobia, school safety legislation, bullying prevention and respect for differences through theater for over a decade. The YouthAware program presents performances both in house at our theater facility and on tour to Northern and Central California schools and communities. We use professional actor/educators who also facilitate a discussion after each performance. While YouthAware exemplifies how the power of theater can be used to educate, enlighten and create social change, my position as YouthAware Director, does not offer me the opportunity to work directly with youth in the same way that most of my QYT counterparts do with their programs. Thanks to the Pride Players, a QYT theater group based at the Rose Theater, that all changed for me at the 2011 MUKTI conference. The Rose Performing Arts Center for children and families was a magical venue for the conference, and some of that magic seemed to seep into our conference agenda throughout the weekend. We were treated to a very entertaining, funny and poignant performance by the Pride Players the evening we arrived in Omaha, and we were given the opportunity to work with them directly to devise theater pieces a couple of days later. Both experiences really enhanced my passion and focus in the work that I do with YouthAware and inspired me to want to do more. Coming from San Francisco, just the fact that I was watching a group of teens in Omaha of all places (many of whom I later learned are straight allies and do not identify as LGBTQ themselves) perform honest, funny, sharp, insightful scenes and monologues that really comment on their experience as queer youth and allies was a powerful experience for me. Later in getting to work directly with these teens, I came to realize that theater has a power not only as an educational tool, but as a transformative vehicle to give a voice to those who may not have had one before. It is a form of artistic expression that offers a certain sense of safety, and catharsis even when exposing an audience of strangers to your greatest joy or your darkest demons. Getting to observe and work with the Pride Plays inspired me to want to create a similar Queer Youth Theater group based at the New Conservatory Theater Center in San Francisco. We already have a conservatory of young actors and a queer and allied community in place here that I know will embrace this endeavor. It just makes sense for San Francisco to be a part of the national QYT network that the MUKTI fund has created. I was once again impressed and inspired by the new theater groups that joined is for the conference this year. I look forward to expanding our network even further, visiting the Theater Offensive in Boston in 2012, and we hope to host the conference in San Francisco at the New Conservatory Theater Center in 2013.